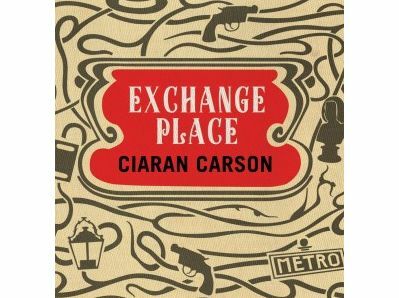 While Ciaran Carson is best known as a leading poet, he has also written at least one crime novel. Exchange Place: A Belfast Thriller (2012) is set between Belfast and Paris and follows two men as they try to solve a mystery concerning a lost friend, a missing notebook and a gun. "Exchange Place is gloriously uncategorisable. Robbe-Grillet would have welcomed it, as would Queneau and Perec, but Hammett and Chandler too would have tipped the brims of their trilbys in salute." Born into an Irish-speaking family, Carson attended Queen’s University Belfast. He was the Arts Council of Northern Ireland's Traditional Arts Officer from 1975 to 1998, when he was appointed a Professor of English at Queen's University. He became director of the Seamus Heaney Centre for Poetry at Queen’s in 2003. Besides many poetry collections, he is also author of the novel Shamrock Tea (2001), he explores his interest in traditional Irish music in Last Night’s Fun: About Music, Food and Time (1997), and his memoir The Star Factory (1998) deals with the history of his home town of Belfast.